On a recent trip to Leipzig, I visited the art museum and on my way out I saw a piece of art hanging on the wall that caught my attention. It wasn’t a masterpiece by some renowned artist, or an intricate piece that would have taken years to perfect. Instead it was a simple neon-letter sign with only four words. 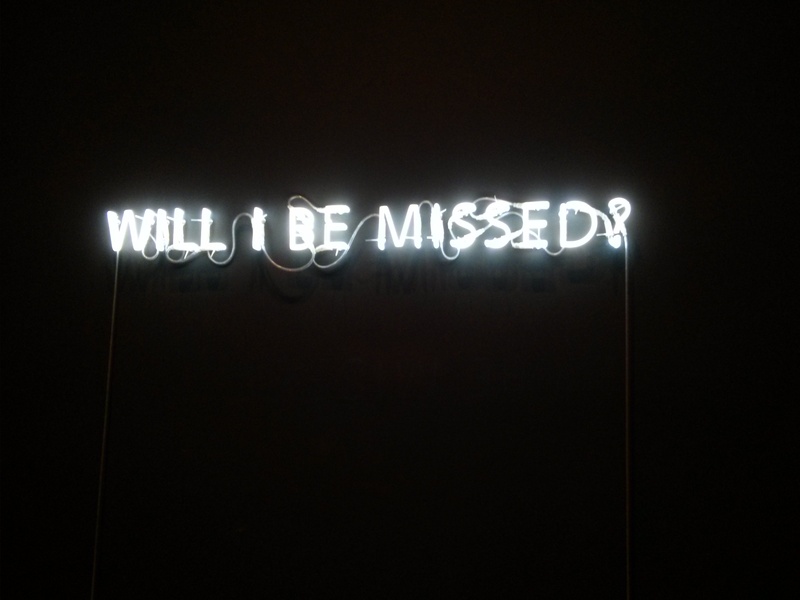 It said “Will I Be Missed?” That got me thinking about my life so far. not in a morbid sense, where I delved down deep and got depressed about how short life is in this world. No, instead it got me thinking about my life in a totally different way. The quick answer: yes, by my family, friends, etc. The long answer: Yes and no. Of course my family will miss me if I die before they do, but is that enough. My friends will probably miss me too, but again, is that enough? Why will they miss me? Is it really even about me? Should I care if people miss me? After I got through the initial selfish thoughts about how people will miss me, because I made them smile, or because of the trips we went on, etc. I started to realize that I really shouldn’t care if people miss me or not. It really isn’t about me. What if I cared more about leaving a legacy than people knowing my name? A legacy lives on with or without yours or my name. A legacy is more about impacting future generations than having people know who I am in 100 years. So what is your legacy? What about your life, your beliefs, your visions would you want future generations to hold true to? What is the most important thing that you can pass on? I just started meeting with 5 Freshman boys on a weekly basis to discuss the Christian life and all of the things that come along with that. This is where a legacy can begin. I can help these guys see truth and then in turn they can help others see truth and after the domino effect kicks in, years later we can have so many people seeing the truth of Christ and they may only know the name of the person who shared that truth with them. They may never know my name….and that’s just fine by me! Forget about whether you will be missed or not and start thinking about how you can impact the future of this world with or without your name in the history books. What legacy are you going to start today?